Interestingly enough, I’ve learned that success comes in different forms. There’s financial success, success in your career or family. There’s spiritual success and even physical success! 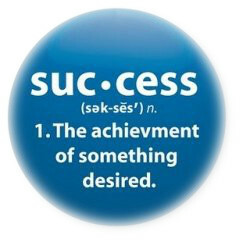 The formal dictionary definition of success is “the accomplishment of an aim or purpose”. So if you want to lose some weight, and you do, then you’ve just had some physical success! High five! You need to start by defining what success is to you! The world seems to only see financial success. That’s too bad, because there should be more family success around, and more personal goals not related to material things. You often need to get up a little earlier than you want to get up. You have to give more time and effort with little pay out initially. The return comes later, be patient. Be prepared to feel like you care more about others than they care about you in return. When you’re tired and worn out, you will have to keep going. Risks need to be taken that you normally wouldn’t feel comfortable. Stretch your comfort zone!. Start leading, even when no one else is following you. They’ll catch up or come around. Sometimes you’ll end up failing or looking stupid, each failure is a stepping stone to success..
Focus on the details when it’s easier to shrug them off. But don’t get bogged down in details either. The “facts” are what everyone believes, sometimes you need to question them and find your own explanations. When you start to feel beat or discouraged, you’re heading the right way, keep going! People will be haters and cruel, accept this and the fact that you’ll have to smile and be kind to the jerks sometimes. Even though things can and will go wrong, you have to be accountable for them. Don’t make excuses. It’s easy to just want to avoid the hard things, pretend they’re not there. That doesn’t help your situation. Start with the worst first, get it done, move on. The things that bug me the most is how long it sometimes takes to get past the hard things. Deep breaths, “this too shall pass”. You can’t enjoy the sunshine without the rain, and the rain doesn’t hang around forever. And you know what? You may just surprise yourself at how awesome you really are! Every once in a while anyway.